If there was one name in French furniture design that occurs more often than not, it is that of Andre-Charles Boulle. Although he lived during the 17th Century and early 18th Century (1642-1732), his designs have been copied, particularly during the 19th and early 20th Centuries and the term Boulle work is widely used. This is a design combining a marquetry of cut brass work on a base of scarlet or blonde tortoiseshell. 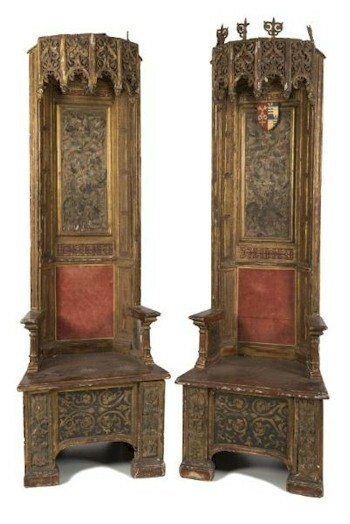 A pair of 16th Century Italian decorated wood thrones (FS22/974) sold in the Spring 2014 Fine Sale for £9,000. Andre Charles Boulle was appointed Royal ebeniste to Louis XIV in 1672 and as such supplied much furniture to the Palace of Versailles. There are a number of pieces by the master ebeniste in The Wallace Collection. The second towering figure in French furniture making is Jean Henri Riesener, who followed Boulle chronologically living from 1734–1806. Although of German origin, he gained acceptance in Parisien circles by marrying the widow of the furniture maker Oeben. Riesener was appointed as ebeniste to Louis XVI in 1774 and made many fine pieces of furniture for the Royal Palaces of Versailles and Fontainebleu. George Jacob (1739–1814) was a French furniture maker of considerable stature. He worked in a classical Greek/Romano style and although trained in the rococo Louis XV style, he quickly turned to the Louis XVI style of simple outlines and straight legs. George Jacob survived the revolution and produced a number of pieces for the Bonaparte family. Perhaps the most famous German cabinet maker of the 18th Century is David Roentgen. His father Abraham Roentgen had founded the business and had established strong links with England. Davin Roentgen, indeed, styled himself the Englischer Kabinettmacher! The great market was, though, in France and David Roentgen sold a number of pieces to Louis XVI, notably a marquetry secretaire with integral clock and musical box for a sum equivalent to a sum of £10,000-£15,000 in today's terms. He also sold a number of pieces to Catherine II of Russia. Another important German cabinet maker, who was supplier of furniture to the Royal Palaces of France, was Adam Weisweiler (1750- 1810). By 1777, he had settled in France and supplied furniture for Marie Antoinette at St Cloud and also for the Prince of Wales at Carlton House. He also survived the revolution and went on to secure the patronage of the Bonaparte family. In Italy, the name of Giuseppe Maggiolini (1738-1814) is pre-eminent, particularly with marquetry pieces of furniture based on rectangular designs. He was highly regarded by his contemporaries in Milan and eulogized the 'Gloria della sua Patria'.